It was getting old trying to paint like a photo, so I did some original nature paintings. Painting is supposed to be fun! I wanted some freedom, so I changed it up a bit. 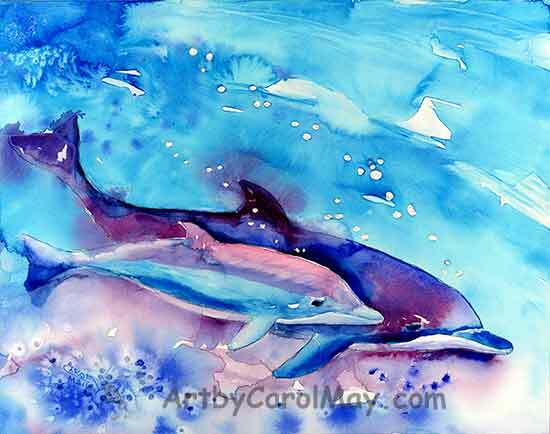 My dolphin paintings were always painted with the dolphin's natural grey color. 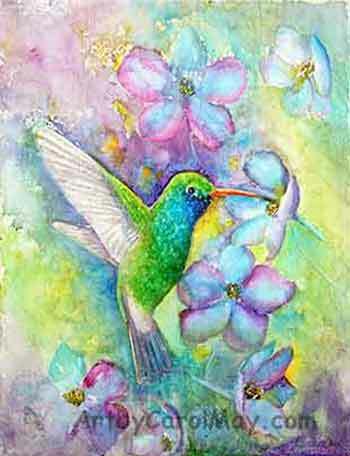 This time I let it loose and painted with the fun colors of pink and purple with turquoise. I let my artistic imagination fly free. No more trying to paint like a photograph. The result was "Flying Free". The seagull is realistic, but the background is breaking loose into freedom. Manatees are interesting creatures seen in Florida. Some people call them Sea Elephants. They are slow moving and very quiet and gentle. They just like to eat vegetation to support their massive bodies. These "Two Gentle Giants" are painted in fun, free colors. After I did the dolphin's painting in pink and purple, I thought it was so much fun, I used the color combination again. In Florida it is quite common to see the egrets out walking among the lily-pads looking for something to eat. This time because the egret had a yellow-orange beak, I made some of the lily-pads yellow-orange. 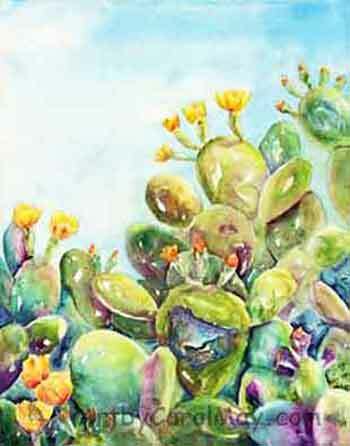 What fun to paint these original nature paintings in a free style! 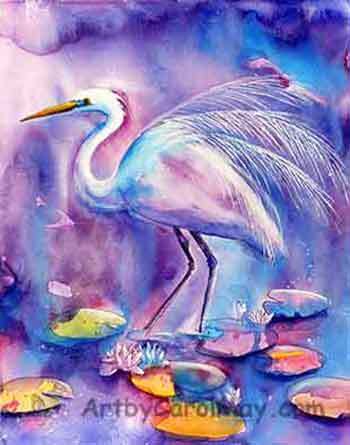 "Egret and Lilies"
The "Broad-billed Hummingbird" has a natural freedom with its iridescent greens and blues. They also have an orange bill. Most other hummers have dark bills. This painting on watercolor canvas. It is more difficult to get detail on the canvas. The colors slide around on the canvas, so I did the delphinium flowers in a free style. 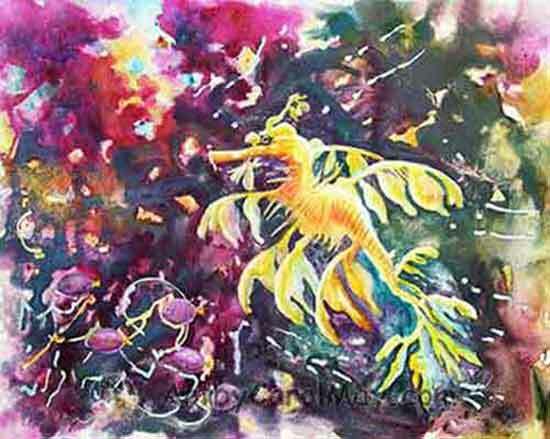 It was fun doing this "Leafy Sea Dragon 'n' Purple Tangs". The leafy is yellow, a complimentary color to the Purple Tangs. Leafies can actually change colors to camouflage themselves. You see a group of five tangs swimming in front of the leafy. Purple Tangs actually are purple with yellow tails - amazing. Did you know - Many paintings may be used for digital streaming to Acanvas digital picture frames available on your phone or TV. It is a new feature supported by Fine Art America. 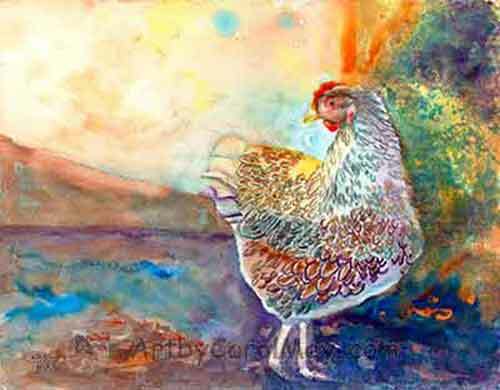 Fine Art America does all the printing and shipping of my archival reproductions made from my original paintings. They do very good work. "Lacey" is another original painting done in a free style. She is my version of a Blue-laced Wyandotte chicken. The background is especially free. The only thing very realistic is her face. 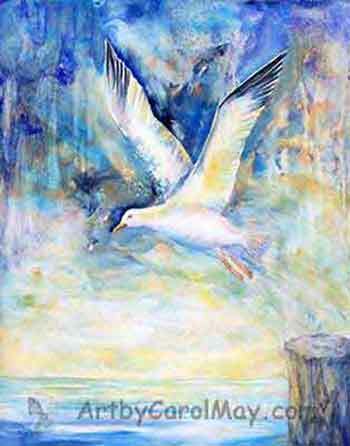 I just let it fly free in this original nature painting. 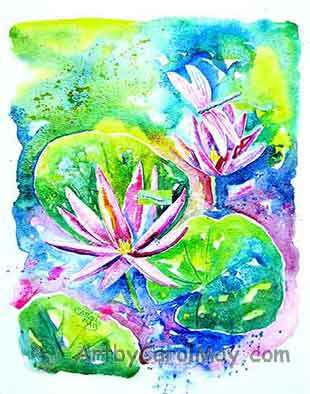 Bright yellow-green with the reddish-violet made a very colorful painting. Do dragonflies come in pink? They do in this painting. It was fun doing the "Dragonfly and Lilies". There is freedom in simplicity. Babies are always cute, no matter what kind of baby they are. 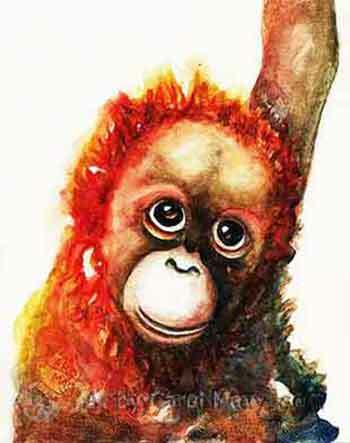 Here is a simple, free painting of a "Baby Orangutan". The style of this painting is not out of the ordinary. The subject is what is extraordinary. I noticed some Prickly Pear cactus plants with leaves that are hollow inside. My mind ran free and I thought that would be a perfect place for a "Hummer's Refuge". The large cactus thorns would certainly keep the hummer's nest safe from predators. 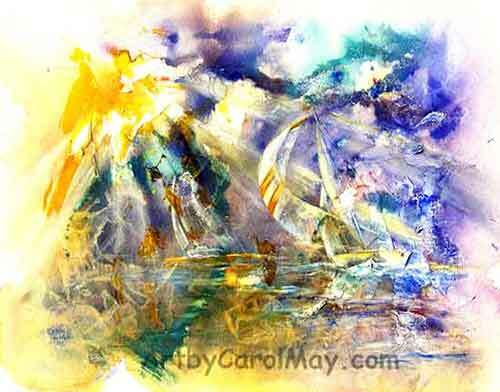 Another painting from my freedom series is these sailboats heading out of the storm toward "Freedom's Light". The painting is done with mixed media. It's an easy painting method you can learn. Some animals are naturally so amazing, they don't need anything to enhance them. 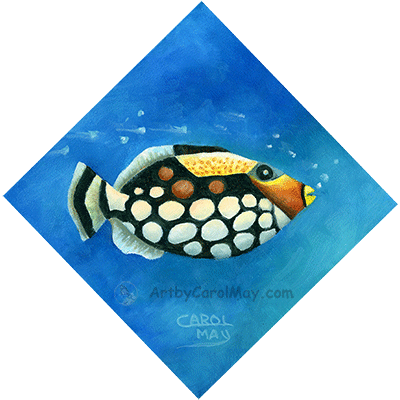 They are an original like this "Clown Triggerfish". I certainly enjoyed doing this original nature paintings series. CLICK ME to enjoy nature paintings in your home! 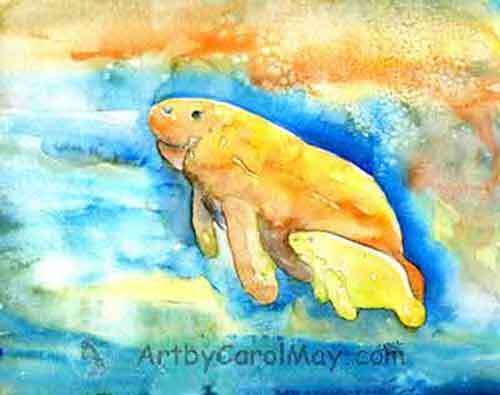 "Bold Freedom" the turtle painting on Nature Paintings 1 is also from the freedom series. The "White Peacock Butterfly" a Butterfly Painting is a freedom series painting.